It's really hard to see in the photo, but they are stacked in twos and will begin to from an arch that you can sit under. In this photo, there are two rows and they begin to climb like stairs and they will wrap around until they make the never-ending staircaise. I have four of them bonded by the stems to make a diamond which will then be used to...well, I'm still looking into ideas for it. This was actually my first photo that I took. 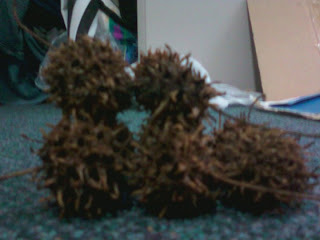 Apparently if you crush the sweetgum balls together, they stick together quite well, (as well as the carpet). 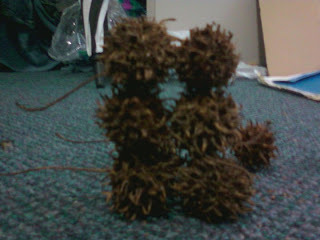 However, I think I'm going to stick with hot glue in fear of the balls falling apart during the building process. 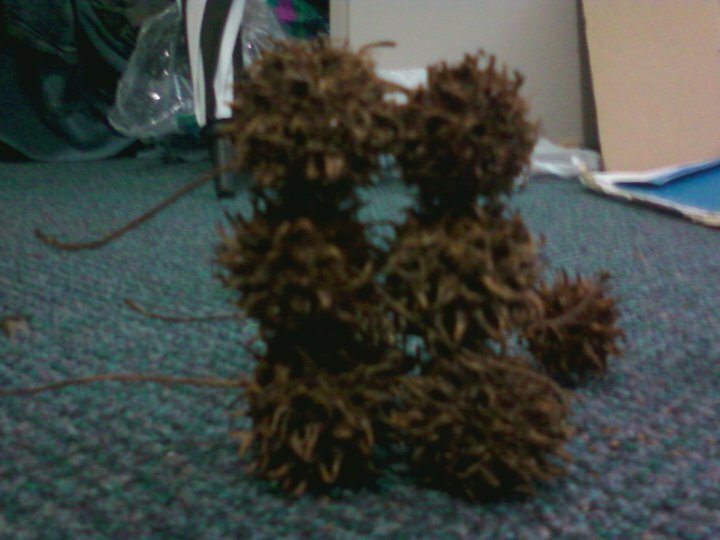 It is really hard to see in the photo, but the sweetgum balls are actually twisting into a DNA like shape.